Very cool 3rd Superman cover ever! Believe it or not, there are only several copies that have graded higher than this Good+ copy. The book is intact and has terrific eye-appeal and strong cover colors. Pages are supple and off-white. There is a 1/2" edge tear at right of front cover and a tiny, tiny chip off the bottom right corner as well. Staples are rusty and there is a split at bottom of spine, about 1.5". Back cover doesn't have creasing or tears, but does have a moderate chip out of the bottom edge, almost 2" long and 3/4" wide. 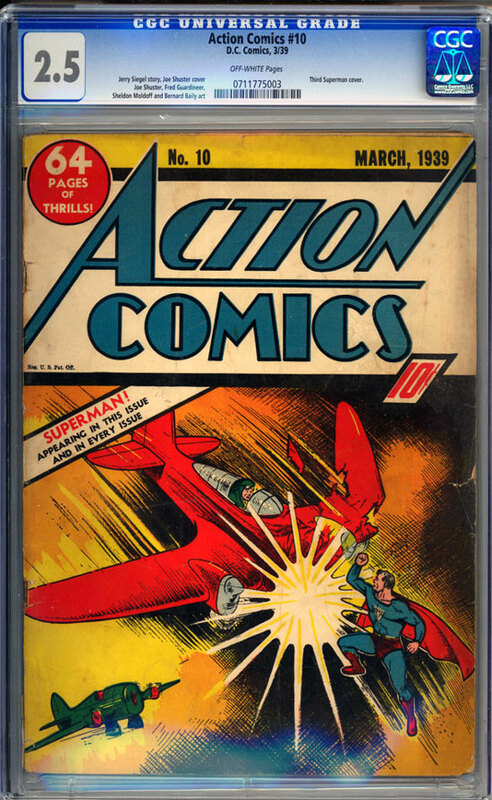 All-in-all, a very respectable and affordable copy of this rare and highly sought-after issue.